Welcome to SitcomsOnline Digest! The TCA Winter Press Tour has wrapped up this week, with one big highlight coming from NBC. Additionally, there is news of a possible spinoff for black-ish, the death of an NCIS: Los Angeles star, and more. 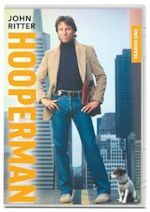 Hooperman - Season One (DVD, $34.99) and Hooperman - Season Two (DVD, $34.99): Both seasons of the 80s comedy-drama series starring John Ritter and created by Steven Bochco and Terry Louise Fischer arrives on DVD in this release. Who to Follow: Debra Messing (Twitter), "You liked Will & Grace? Miss Perception? Well, Happy New Year: TRAVELERS is streaming right now @netflix!" Claim to Fame: For our Follow Me last week, we featured Eric McCormack, who played Will on the NBC series Will & Grace. Little did we know that this week, that series would be making news, as NBC announced the limited run reboot, so this week, we're presenting the other half of that duo, Debra Messing (who played Grace). But that series wasn't her first series in which she played a title half of a duo in which the show was named after the characters, as her first regular TV role came in the Fox series that was rather short-lived, but somehow still lives on today in reruns, Ned and Stacey (she played Stacey). In 2012, she had a starring role in the NBC series Smash, a rare series for her in which her character name was not Smash. But most recently, she appeared in the role of Laura on the NBC series The Mysteries of Laura, continuing her tradition of playing title characters in TV series.